The flow of the initial fight with Brick is interesting: He takes several shots at a dodging Speedy, for example: Single in-game “action” or some type of special multi-attack maneuver or ability? Similarly, Aqualad slices a flying boulder in half as a defense, putting his offensive capabilities to work. Some games might differentiate between these types of defense: Icons, for example, allows substituting one ability for another as a stunt (or a blocking maneuver). Did Aqualad use his Prowess or Strike level to defend there? Note that Speedy also takes a lateral move to deal with the invulnerable Brick: He can’t hurt him, but a fast-hardening polymer foam arrow puts him out of commission. Unfortunately, the team’s request fall on deaf ears: “Your ‘Junior Justice League’ is a joke,” Speedy says, walking off into the shadows. It certainly seems that way back at Mount Justice, the former “Secret Sanctuary” of the League, now retrofitted as the headquarters for the Team (which is never referred to as anything else). They get the complete tour and time to interact – “flavor text” as some might say, but also important opportunities to introduce more about the characters as they get to know each other. Then we get a look at Miss Martian’s shape-shifting bio-ship, an important asset for the Team. Both the headquarters and the ship are things various games need to handle. Superhero teams frequently have both a home base and one or more vehicles. Are they “paid” for in some fashion by the characters or provided as default assets of the series? Games like Mutants & Masterminds and Champions tend to handle it the first way, Icons tends to handle it in the latter way, although individual characters can also have vehicles. Still, it seems unlikely Miss Martian “paid” for her bio-ship and all of her Martian powers. While the bio-ship is largely a plot-device, it does come into play, as we shall see. An attack at a nearby power plant draws the Team’s attention to “Mister Twister,” an armored figure with a familiar red color scheme and the ability to command tornadoes (also an homage to the first adventure of the Teen Titans in the comics). The Team initially thinks Twister is Red Tornado in disguise, looking to test them (borne out by his appearance, powers, and immunity to Miss Martian’s telepathy) but realize he is not when he displays other weather powers, like calling lightning. Twister fells the entire team, but Miss Martian interposes her bio-ship between them, making it seem like they have disappeared. The Team rallies to stop Twister, who is tearing up Happy Harbor in an effort to draw out Red Tornado, and Miss Martian comes up with a plan to stop him. Red Tornado does show up to confront Twister but, when the villain knocks him down and attempts to reprogram him, “Tornado” reveals he is actually Miss Martian in disguise (creating whirlwinds with her telekinetic powers and Kid Flash’s assistance). The stunned Mister Twister is quickly taken down by the members of the Team. When he falls out of his damaged armor, Miss Martian crushes him with a large rock … revealing he, too, is an android. In a secret lair elsewhere, scientist T.O. Morrow (creator of the Red Tornado) comments to his assistant “Brom” (Bromwell Stikk, the real name of Mister Twister from the comics) that he should be happy he wasn’t really in the armor. The Grand Tour: Roleplaying games are, sometimes, about playing a role. That means the stories—from individual sessions to whole series—need some room the breathe, and some scenes for the characters to interact. Don’t necessarily neglect the grand tour of the heroes’ new headquarters, or an opportunity for them to take a spin in their cool new ship, or a trip to the malt shoppe (before they’re ambushed by the Hellfire Club … oh, wait, wrong team). Point is, some of the non-game system interactions of the characters can be some of the most interesting parts of the game. Of course, some games systemize these interactions as well, at least placing a game-value on them. Marvel Heroic provides in-game benefits to down-time in terms of recovery. Icons (in the Assembled Edition) offers the option of awarding Determination for some good storytelling or roleplaying in quiet moments such as this. One could do the same with Mutants & Masterminds hero points. When It’s Over, It’s Over: It’s interesting to note that all of the Team’s attacks after Miss Martian’s reveal are practically denouement—Mister Twister’s defeat was a foregone conclusion right from the moment he realized he’d been tricked. It was a tipping point. An interesting mechanic to apply to RPGs is a similar “reversal of fortune.” The Torg RPG uses one for its horror reality, for example: Until the heroes overcome “the power of fear,” the monster gets all kinds of advantages over them that make it much harder to beat. A villain could have the same initial advantage, with the heroes wearing away at it until they get the upper hand. The accumulation of in-game resources reflects some of this, although not quite as decisively as flipping a win-lose switch. The Best Defense: Super-types use all kinds of abilities to both attack and defend in conflicts. A game should take some of this into account, allowing for opportunities to do stuff like slice or blast an incoming attack, or block a punch with your power to create tornadoes and the like. It lends a lot to the notion that heroes all fight differently and tremendous agility and near invulnerability are just two ways of managing to stay in a fight longer, and far from the only ones. Next: The Team finally gets its first mission. Behind enemy lines, and without a clear leader, can they succeed? 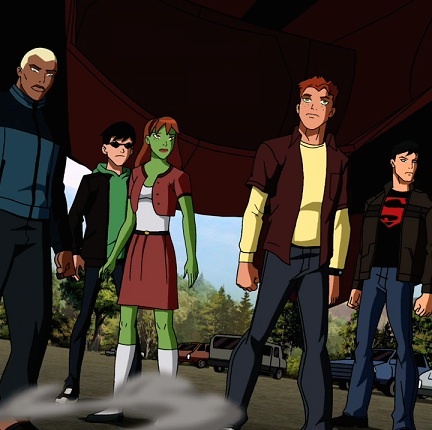 This entry was posted in Re:Animated and tagged reanimated, young justice. Bookmark the permalink. Using all kinds of powers and skills for attack and defense is a real strength of the Supers! game system.